For something a little unusual to use the very last of that heirloom tomato, we created a cream cheese (labné), smoked salmon, capers and tomato wrap. Unconventional but it tasted fine. Add 25c for capers and labné. Lunch today was tasty for $4.57 per serve. 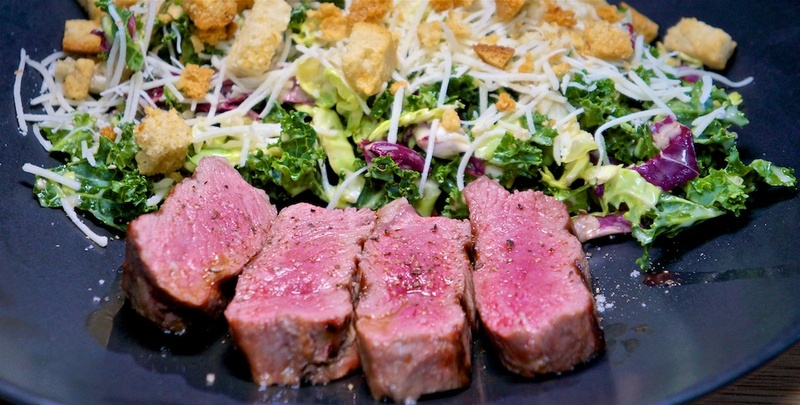 A simple steak and salad meal. NY Strip steak from our Prather Ranch delivery, and a Taylor Farms chopped Kale Salad. The salad was $3.49 or $1.75 per serve. The steak was perfectly grilled and tasty but we didn’t really enjoy the salad. An okay meal for $11.87 per serve.